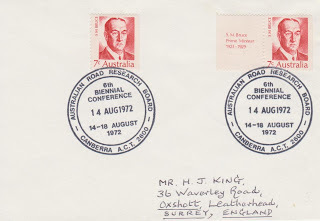 A 1972 Australian cover showing two of the Stanley Melbourne Bruce booklet stamps which were issued on 8/3/1972. The better road to the left serves two of the most isolated farms in Caithness, Ballach!y and Munsary. At the former is an ancient burial ground with the remains of a chapel. Here lie the mortal remains of the past inhabitants of these once heavily populated areas who always fondly referred to the district we are traversing as "the hills". At Munsary, where its two and a half thousand hectares is now completely devoid of people, it is difficult to believe that just over a hundred years ago there was a well attended school where the writer's maternal grandfather went as a pupil with a peat under his arm as well as his books. 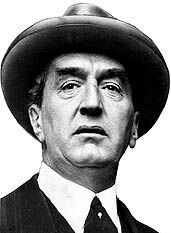 Munsary was the home of the old family, the Bruces of Munsary, who intermarried with nearly all the families of "the hills" as well as sending scions abroad to distinguish themselves in many fields including one who was Prime Minister of Australia in the nineteen twenties.